Many films and television shows are set within the walls of a prison. There’s plenty to contemplate and be explored regarding how someone came to be incarcerated, and those serving as guards and in other administrative positions often have just as much to offer as rich characters with their own complicated reasons for why they went into this field. There is a point at which prison stories can seem to bleed together, covering similar notions without truly discovering anything new and eye-opening along the way. This film is not one of those. 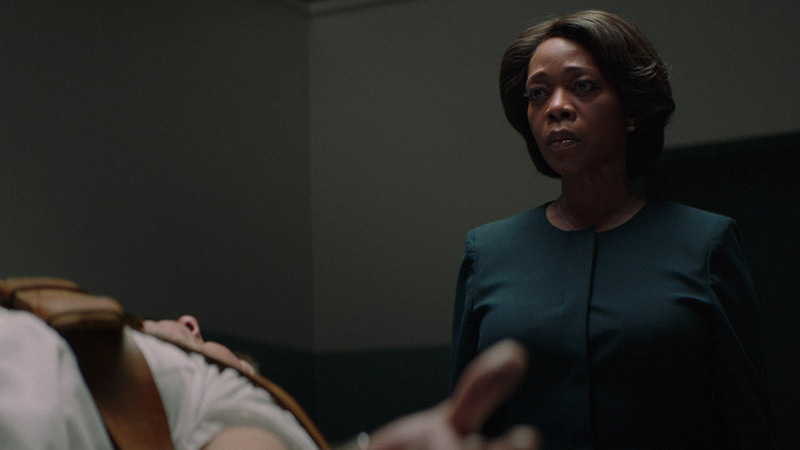 Bernadine Williams (Alfre Woodard) serves as warden of a men’s prison and supervises her eleventh execution, which is scrutinized after a prolonged process that indicates great suffering right before his ultimate death. As the execution date of Anthony Woods (Aldis Hodge) approaches, Bernadine, a by-the-book, stern executive, finds herself disturbed by his fate and her work, which also pushes her further away from her husband (Wendell Pierce). Anthony’s lawyer (Richard Schiff) meets regularly with his increasingly desolate client, still hoping that a last-minute granting of clemency may occur. This is a film that explores two sides of death row: the person experiencing it and the ones participating in it. Director Chinoye Chukwu shared that she was inspired by the execution of Troy Davis and having read about the emotional and psychological influences on the prison staff who had to kill him. After working on a number of clemency cases and teaching incarcerated women how to make films, Chukwu put together this project, in which meticulous details were crucial, involving death row lawyers to read and rip apart the script, wardens and chaplains on speed dial, and a corrections officer consulting on death. The efforts Chukwu made to preserve authenticity are notable, and they’re matched tremendously by the actors involved. Woodard begins by giving Bernadine a hard shell, one that slowly melts away in more intimate moments even as she maintains that front to keep up the appearance of authority and certainty. Hodge is nothing short of mesmerizing, conveying so many emotions but most effective is his depiction of a complete speechlessness as he nears his end, almost immediately replaced by euphoria at the notion of what likely won’t but still could be. This is a powerful and haunting film, one that looks at a complex situation and responds without answers but with true humanity instead.